PYEONGCHANG, South Korea -- The grand plan when Red Gerard and his brothers set down rails and attached a tow rope to a dirt bike to fashion a snowboard park in their backyard wasn't all that grand. Gerard captured America's first gold medal of the Pyeongchang Games - first medal of any color, in fact - and will soon go on a victory tour he never saw coming, even if the rowdy, red-white-and-blue mosh pit full of friends and family at the bottom envisioned it all along. 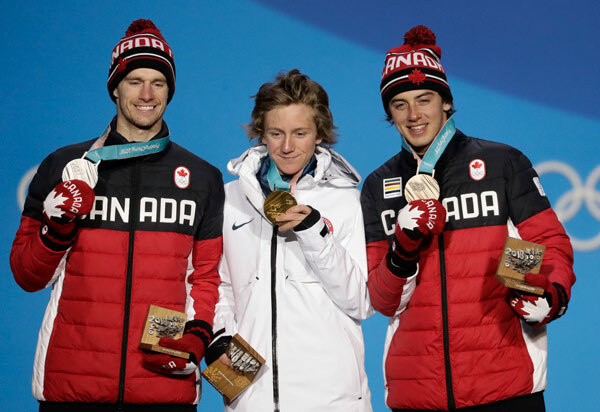 Men's slopestyle medalists, from left, Canada's Max Parrot, silver, United States' Red Gerard, gold, and Canada's Mark McMorris, bronze, pose during their medals ceremony.